Rainy days won't keep us down. Sunday night, we hosted our first video night at Silver's at the Wharf in Fort Bragg's Noyo Harbor. We opened the evening with our new Mendocino Coast Sea Kayaking video followed by our recent Rock Gardening video. The audience was dazzled, amazed, and amused by Chuck Lees' film Local Liquid. 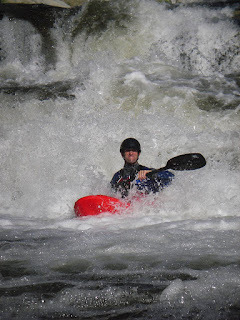 It definitely got us psyched up for our upcoming whitewater kayaking trip to the American River.